Ever wonder what to do with your rice water? I feel like we've been wasting perfectly good water for years down the drain. So I did some research and it turns out that rice water or potato water can be used to benefit your garden plants. Rice water has very small NPK qualities. So don't use it as a replacement to fertilize your plants. Instead it's the starches that is the key ingredient. It cultures and feeds the beneficial bacteria call Lacto Bacilli that can help feed the good fungi like mycorrhizae. Which in turn feeds the plants roots, making it grow stronger, healthier and more resistant to diseases. One of the major workhorse beneficial indigenous microorganism used in natural farming is lacto bacilli. This particular beneficial microorganism is popularly used in composting that specifically arrest foul odors associated with anaerobic decomposition. Lactic acid bacteria thrive and feed on the ammonia released in the decomposition normally associated with foul odors. 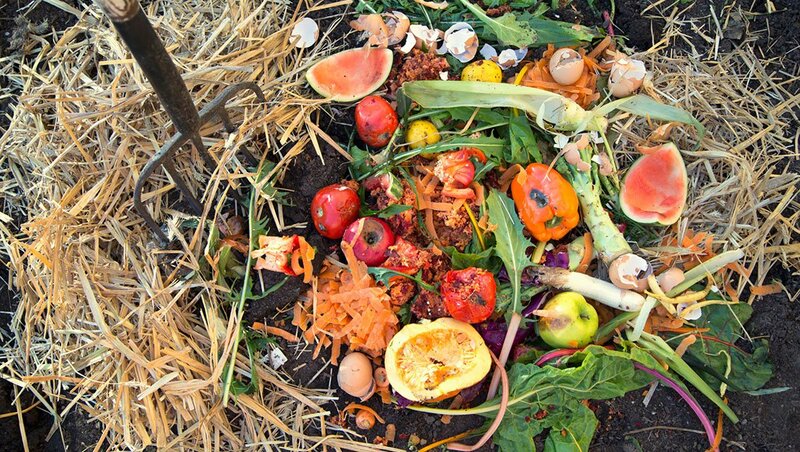 So if you need to decompose or ferment wastes less foul odors, lactic acid bacteria is the specific bacteria to use. Its application in organic farming is enormous. In aquaculture, one of the problem is related to water quality. Poor water quality stresses the fish which in turn stunts their growth and affects their health. This is very evident specially on high density and tank aquaculture. The ammonia produced through fish excretions pollute the water and stress the fish. With regular addition of this beneficial microorganisms to the water, this ammonia problem is minimized, if not fully arrested. 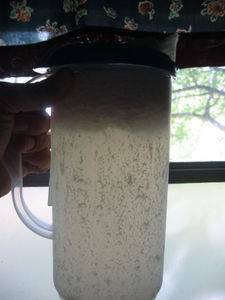 It helps hasten or complete the denitrification or converting wastes into forms not harmful to fish. Spraying diluted solution of lactic acid bacteria serum to the plant and soil helps plant growth and makes them more healthy. As it is applied to the soil or the leaves, these beneficial bacteria aid in the decomposition process, thus allowing more food to be available and assimilated by the plant. Here’s a simple method of collecting this type of microorganism. Lactic acid bacteria can be collected from the air. 1. Pour rice wash (solution generated when you wash the rice with water) on a container like plastic pot with lid. Allow air gap at least 50-75% of the container. The key here is the air space. Cover the (not vacuum tight, allowing air still to move into the container) container with lid loosely. You'll get gnats who are attracted to the foil smell. And boy does it stink. 2. Put the container in a quiet area with no direct sunlight. Allow the rice water to ferment for at least 5-7 days. Lactic acid bacteria will gather in 5-7 days when temperature is 20-25 degrees C or 68-77F. 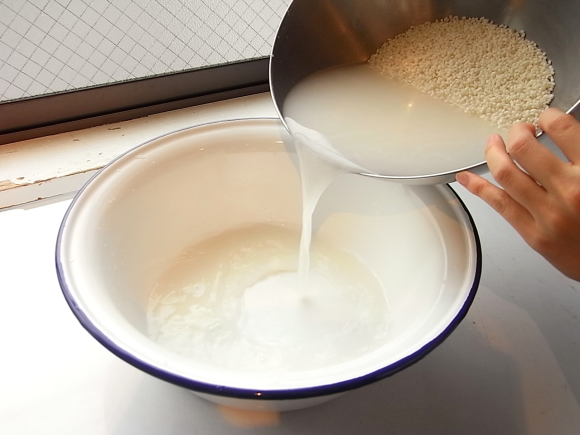 Rice brain will be separated and float in the liquid, like a thin film, smelling sour. Strain and simply get the liquid. 3. 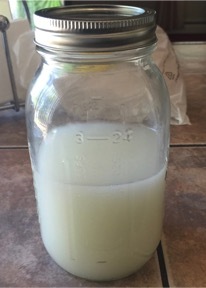 Put this liquid in a bigger container and pour ten parts milk. The original liquid has been infected with different type of microbes including lacto bacilli. And in order to get the pure lacto bacilli, saturation of milk will eliminate the other microorganisms and the pure lacto bacilli will be left. You may use skim or powdered milk, although fresh milk is best. In 5-7 days, carbohydrate, protein and fat will float leaving yellow liquid (serum), which contain the lactic acid bacteria. You can dispose the coagulated carbohydrate, protein and fat, add them to your compost pile or feed them to your animals. 4. The pure lactic acid bacteria serum can be stored in the refrigerator or simply add equal amount of crude sugar (dilute with 1/3 water) or molasses. Do not use refined sugar as they are chemically bleached and may affect the lactic acid bacteria. The sugar or molasses will keep the lactic acid bacteria alive at room temperature. One to one ratio is suggested although sugar, regardless of quantity is meant simply, serving as food for the bacteria to keep them alive. Now, these lactic acid bacteria serum with sugar or molasses will be your pure culture. 5. 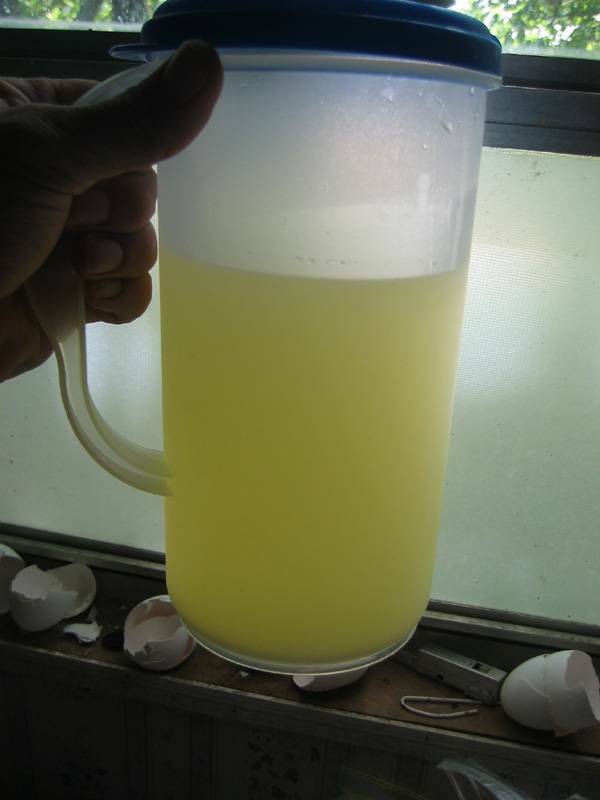 To use, you can dilute this pure culture with 20 parts water. Make sure water is not chemically treated with, like chlorine. Use rain water if possible, it's free. Remember, we are dealing with live microorganisms and chlorine can kill them. This diluted form 1:20 ratio will be your basic lactic acid bacteria concoction. Two to four tablespoons added to water of one gallon can be used as your basic spray and can be added to water. Lactic acid bacteria serum can be applied to plant leaves to fortify phyllosphere microbes, to soil and compost. For any kind of imbalance, be it in the soil or digestive system, lacto bacilli can be of help. One of the popular beneficial microorganism innoculant sfrom Japan (EM) contains lactic acid bacteria as its major component, including photosynthetic bacteria, yeasts, actinomycetes and fermenting fungi. These are pure culture imported from Japan and can be subcultured through the use of sugar or molasses. These other microbes can be cultured in several ways by farmers themselves. 3 days after the milks was added. 10 Days after adding the rice water to milk. Strained and ready to use. This needs to be diluted before use. about a tablespoon to every gallon.